[95 Pages Report] NMP market was valued at USD 526.7 Million in 2016 and is projected to reach USD 795.8 Million by 2022, at a CAGR of 6.8% during the forecast period. The base year considered for the study is 2016, while the forecast period is from 2017 to 2022. Both, top-down and bottom-up approaches were used to estimate and validate the sizes of the NMP market and various other dependent submarkets. The research study involved extensive use of secondary sources, directories, and databases, such as D&B Hoovers, Bloomberg, Chemical Weekly, Factiva, and other government and private websites to identify and collect information useful for this technical, market-oriented, and commercial study of the NMP market. 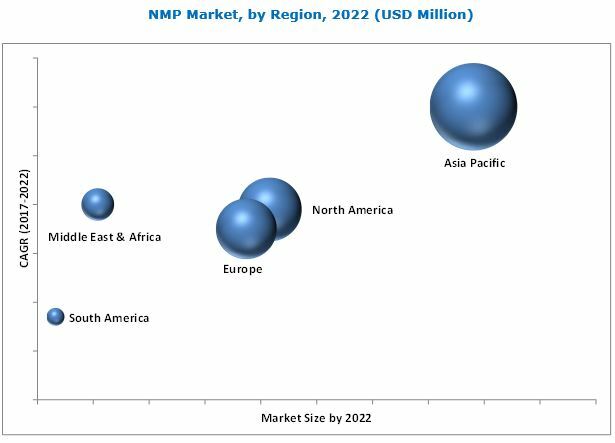 Some of the major players operating in the NMP market include Ashland (US), BASF (Germany), Eastman (US), Lyondellbasell (US), Mitsubishi Chemical Corporation (Japan), and Shandong Qingyun Changxin Chemical Science-Tech Co., Ltd. (China). 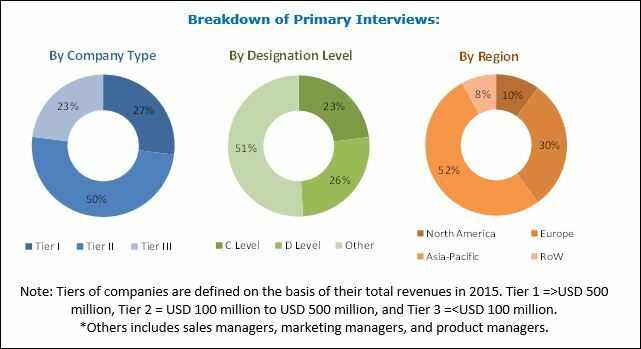 This research report categorizes the NMP market on the basis of application and region. The market has been further analyzed for key countries in each of these regions, except for the Middle East & Africa and South America. The lithium-ion battery production is one of the major applications of NMP. These batteries are widely used in electric vehicles due to their better performance compared to other batteries. The rising production of electric vehicle will fuel the demand for lithium-ion batteries, thereby increasing the demand for NMP for battery production. Many countries are aggressively promoting the electric vehicles to reduce the greenhouse gas emissions. Some of them have introduced various policies to promote the purchase and use of electric vehicles. The sale of electric vehicles across the globe has been observed to increase sharply due to the rise in demand from China in 2017. These factors are boosting the demand for lithium-ion batteries and attracting investments in lithium-ion battery production facilities. Following are the leading lithium-ion battery manufacturers across the globe. Note: AESC= Automotive Energy Supply Corporation, CALB=China Aviation Lithium Battery Co.
Companies are investing in increasing their lithium-ion battery production capacities in emerging markets such as China, the US, and South Korea. What are the opportunities for NMP applications globally? What are the key factors to be considered while investing in NMP market? Who are the leading suppliers of NMP in major markets across the globe? The NMP market size is projected to grow from USD 572.5 Million in 2017 to USD 795.8 Million by 2022, at a CAGR of 6.8% during the forecast period. NMP is used in petrochemical, pharmaceutical, electronics, paints & coatings, and agrochemical industries. In the pharmaceutical industry, NMP is used in the extraction, purification, and crystallization of pharmaceuticals and is also used as an excipient for drugs. The NMP market is categorized on the basis of application into petrochemicals, electronics, paints & coatings, agrochemicals, and pharmaceuticals. Petrochemicals segment is expected to be the largest application segment while the electronics segment is expected to grow at the highest CAGR during the forecast period. Asia Pacific is projected to remain the largest market for NMP. This market in Asia Pacific is expected to grow at the highest CAGR during the forecast period. This growth can be attributed to the increasing lithium-ion battery production and growing pharmaceutical industry in the region. China, South Korea, and India are estimated to experience high investments in the lithium-ion battery production to leverage the increasing domestic demand. Pharmaceutical and agrochemical industries in China and India are increasing their production capacities to meet the rising local demand for respective products. These factors are estimated to drive the demand for NMP in the region during the forecast period. Several lithium-ion battery manufacturers across the globe are increasing their production capacities to meet its rising demand, thereby fueling the demand for NMP in the electronics applications. However, they are also searching for a substitute for NMP to reduce the cost involved in using NMP in the lithium-ion battery production. NMP-based drugs are used in anti-tumor treatments and hence, they are experiencing a surge in demand for use in medicines for cancer treatment. The growing pharmaceutical industry in APAC and South America is expected to create opportunities for NMP manufacturers in the respective markets during the forecast period. Ashland (US), BASF (Germany), Eastman (US), Lyondellbasell (US), Mitsubishi Chemical Corporation (Japan), and Shandong Qingyun Changxin Chemical Science-Tech Co., Ltd. (China) are some of the companies operating in the NMP market.